Katfish Reach is a community environmental rehabilitation project working for a healthier and more productive aquatic and floodplain ecosystem that everyone can enjoy. The Katfish Reach Project is hoping to provide the community with a visible demonstration that the health of the river and its floodplain, and the plants and animals (notably native fish) that depend upon these habitats, can be restored to better condition through coordinated actions that address the major threats. The Katfish Reach project began as a Demonstration Reach for native fish under the Native Fish Strategy of the Murray-Darling Basin Authority. It is the only Demonstration Reach along the River Murray in South Australia. The name ‘Katfish Reach’ was coined through the abbreviation of “Katarapko and Eckert Creek Demonstration Reach for Native Fish”. 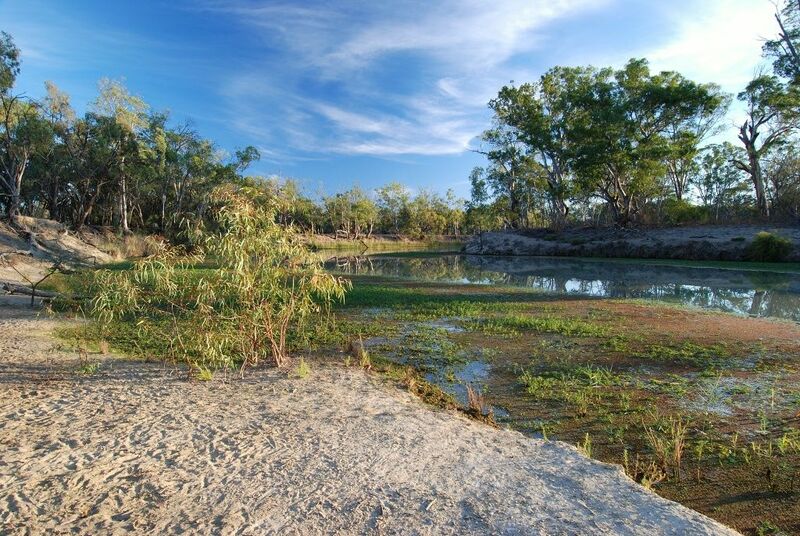 The Katfish Reach is located on the Katarapko/Eckert Creek anabranch system, which comprises about 38 kilometers of waterways. The floodplain covers 9000 hectares, which is situated opposite the town of Loxton and south-west of Berri. The Katfish Reach floodplain bypasses Lock 4. Katfish Reach is a unique and diverse floodplain. It includes a range of habitats from permanent flowing creeks, freshwater complexes, saline wetlands and floodplains. It is home to a variety of wildlife, some of which are listed as threatened species. Within the area there are two reptiles, one frog and 14 bird species with a threatened rating at state level and one frog and two fish with a national rating. 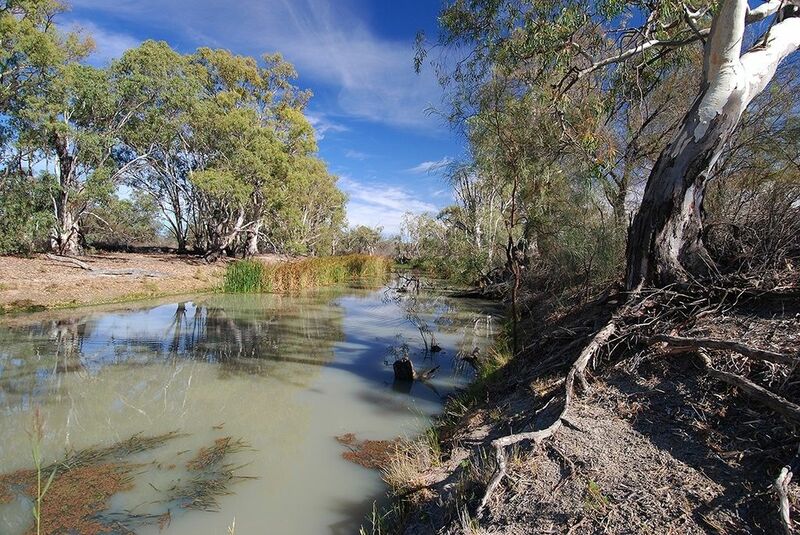 Since the beginning of the project the Murray-Darling Basin Authority has provided funding to assist with the strategic planning of the project, ecological monitoring and community engagement. In recent years, the Australian Government has invested in the project through the Riverine Recovery Project, a key component of South Australia’s Murray Futures program. Community partnership is a key to the success of the Katfish Reach project, with all stakeholders, including recreational groups, friends of Riverland Parks, Local Action Planning Groups, Gerard Aboriginal Community and individuals; working with Government organisations to deliver a coordinated approach to the improvement of the area. For more information go to the Katfish Reach Website or read the article about Katfish Demonstration Reach in the RipRap magazine. 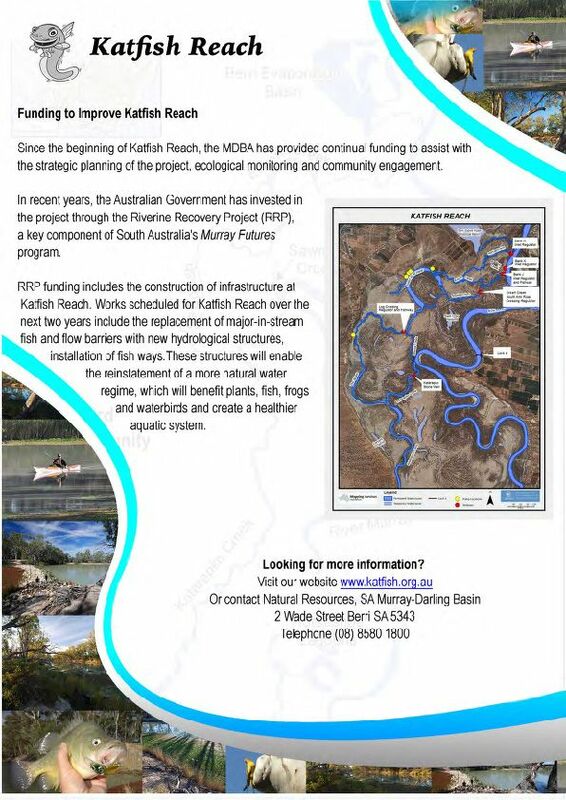 You can also find out more by reading the latest Katfish Reach Fact Sheet.